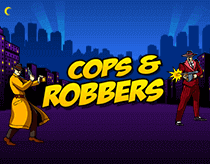 Cops & Robbers is a 3x3 online scratch card game with 1940 retro styling. In the center of the screen are 9 cash images that are hiding values. All you need to do is “scratch” each to find the matching values. When playing max bet, you standard to win a cool, 100,000 jackpot! Now,” scratch” (tap/click) on each square to reveal the hidden value, alternatively select “REVEAL ALL” and all hidden values will automatically be scratched for you. If there are 3 matching values, then that amount is won and will flash in the center of the screen. The total win for a round will also be shown in the “WIN” box located next to the “Buy ticket” button.